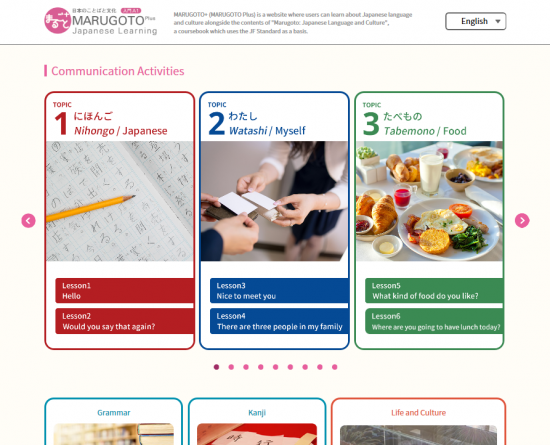 This is a site compatible with the “Marugoto: Japanese ｌanguage and culture” textbooks and you can study not just Japanese and learn about Japanese culture, but also learn about other cultures. 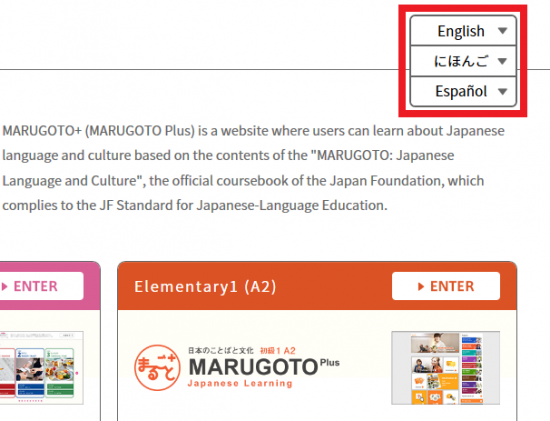 The site is compatible with the textbook, but the contents can also be enjoyed by people studying Japanese for the first time as well as people using other textbooks. 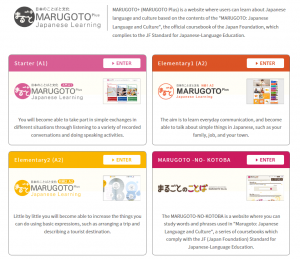 You can study the A1 and A2 levels of the JF Standard for Japanese-Language Education. 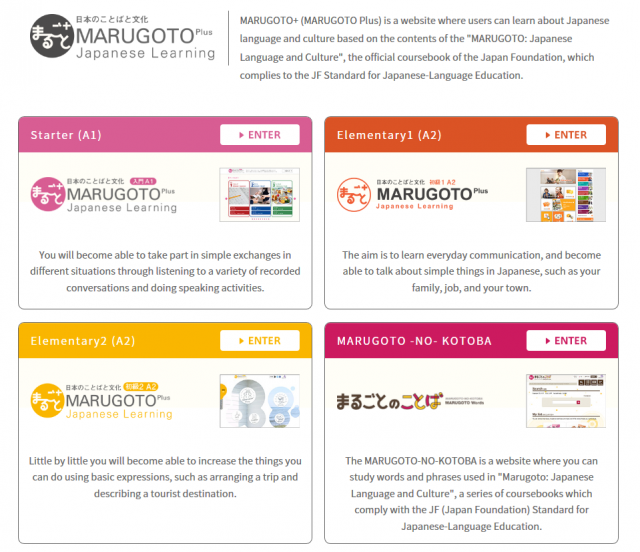 The Starter (A1) site is available in Japanese, English, and Spanish. 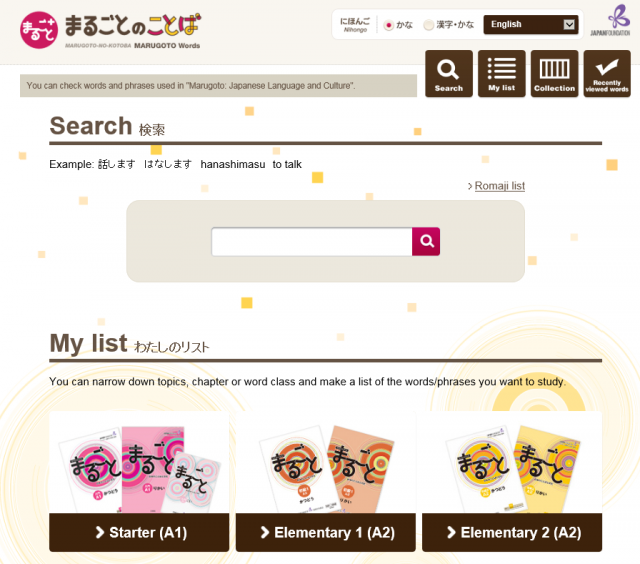 The Elementary 2(A2) site is available in Japanese and English. 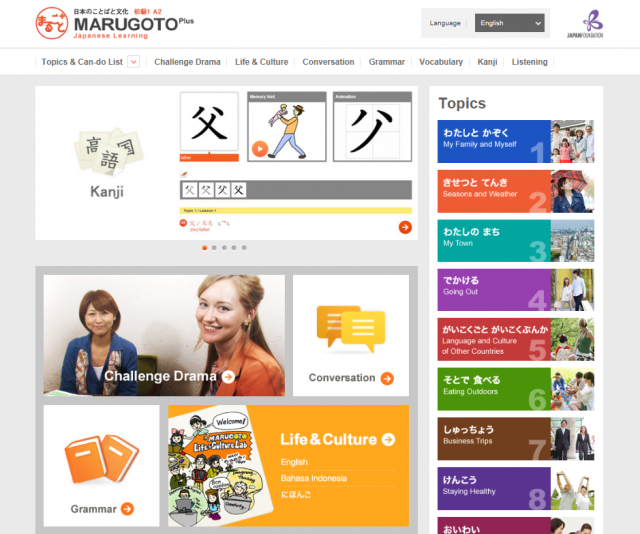 You can comprehensively study conversations, grammar, kanji, vocabulary and more. 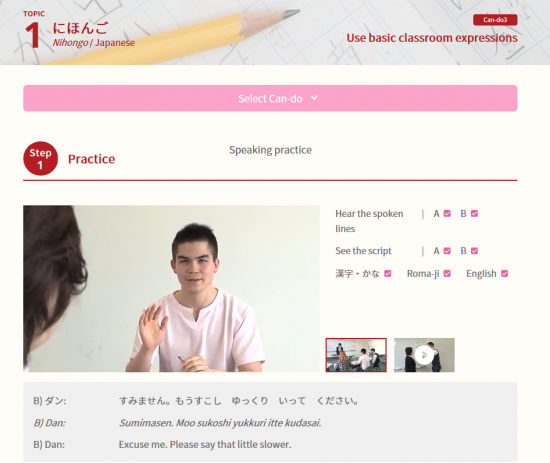 You can challenge communication by using a drama in Japanese. You can understand Japanese culture via videos and pictures. This is the top page for 4 sites, Starter (A1), Elementary 1(A2), Elementary 2(A2), and MARUGOTO-NO-KOTOBA. There is an easy-to-understand summary of each site. You can select the language of the top page. Japanese, English, and Spanish are available. To view the pages, click the “Enter” button. This is the top of the Starter (A1) page. Communication Activities, Introduction, Hiragana, Katakana, and Typing contents. Using "Communication Activities" contents you can review the 'Can-do' targets you learned in the textbook or in class and try applying them in real situations. This is the Elementary 1 (A2) top page. The A2 site has listening contents, not found on the A1 site. 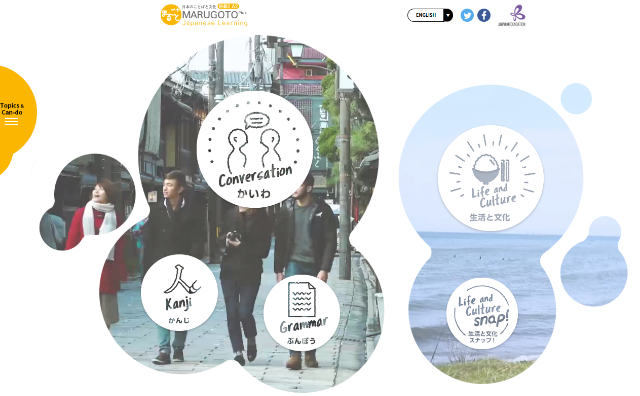 Also, the Life & Culture contents will open in a new window as MARUGOTO Life & Culture Lab. You can read articles related to each topic. 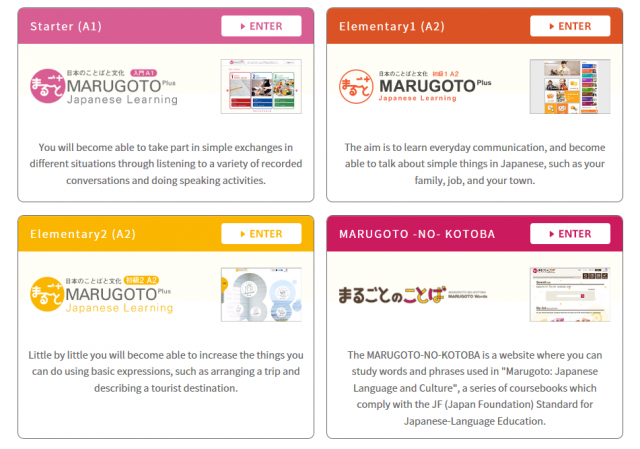 You can practice Japanese in order to achieve various "Can-do" (things one is able to do using Japanese) goals based on the JF Standard. 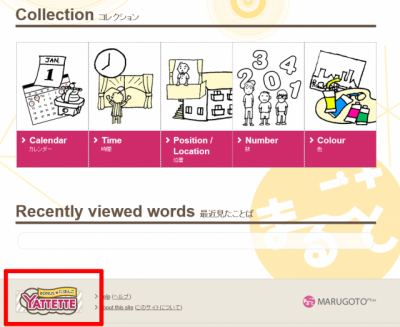 On MARUGOTO-NO-KOTOBA, you can search for vocabulary, create a quiz from your word list and you can see all the words of a certain theme as a collection as well. You are able to print them out too. BONUS☆にほんご YATTETTE is a site where you can find example sentences for sending emails in Japanese, talking to your friends about your hobbies, and using in your daily life. When you want to try out some Japanese, look for the Can-do point that resembles the setting you want. There are lots of vocabulary words and phrases, example sentence patterns in many different situations, so you may find an example sentence that comes in handy. This site has a smartphone version, too.